Hawaii is susceptible to many types of natural disasters, and its isolation makes our state even more vulnerable. When disaster strikes —whether it is natural or manmade—you need to be prepared. Emergency responders will be hard at work assisting the public, but you may need to survive on your own for a while immediately after the event. There are many things you can do to prepare before disaster strikes, and one of them is preparing an emergency kit. To ensure you have enough food, water, and other supplies for yourself and your family, plan out what you need for at least 14 days. 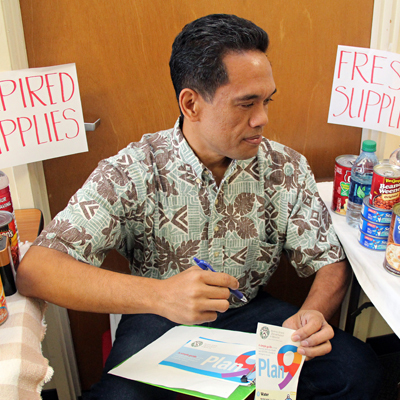 The Hawaii Department of Health’s “Take 10” plan will guide you. Remember, in the event of a disaster, you may not have access to food, water, or electricity for some time. Stock your supplies in an easy to find, grab-and-go kit you can provide for your entire family. For more information, use the helpful tips in DOH’s “Plan To Be Ready” guide. Think about plans for work, home, and school. Don’t forget about your pets, elderly relatives, and those with special needs. Ready.gov has great tips for what to add to your disaster supplies kit. Remember, prepare your kit well in advance of an emergency. It might be a while before help arrives, so have enough food, water, and supplies to last for at least two weeks. Hawaii, Are YOU Ready? Make a Kit.